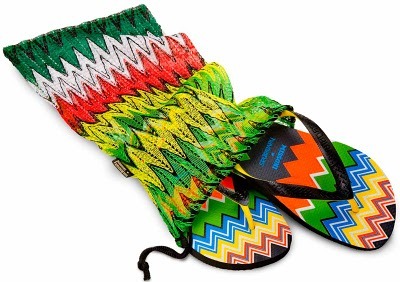 After launching the Wellies the Bazilian brand Havaianas, one of the most popular names in summer sandals, closed a deal with the Italian house Missoni to design a limited edition for the 2011 summer collection. Missoni is a leader in fashion knitwear and it is known for using bold and graphic patterns. Havaianas couldn’t have chosen a better brand to design their ‘couture’ collection.The new styles bring Missoni’s signature tribal pattern in a multi coloured print with black as the background with orange and blue ocean in different designs on three types of flip flops, women’s and unisex slim regular, and the fabric of traditional espadrilles. 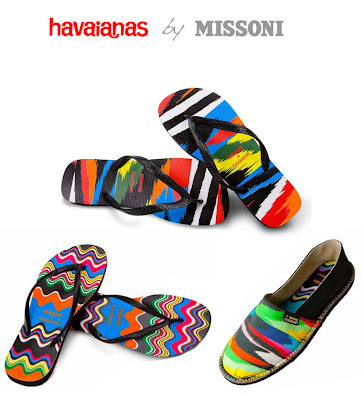 Each pair of Missoni loves Havaianas is sold in a bag-shoes, made in Italy by Missoni fabric and decorated with patterns in the colours of the Italian and Brazilian flags. The white, red and green of the Italian flag merge and intersect with the green and yellow of the Brazilian in the pattern chosen for the packaging. 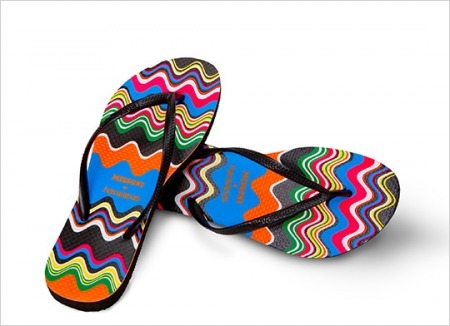 The prices of flip-flops and espadrilles range from 50 to 130 Euro and the entire collection is available in boutiques Missoni, from Luisa Via Roma in Florence and on the sites net-a-porter.com and havaianas-store.com. Another must-have for next summer, don’t you think? The new collection was launched in Brazil on April 25th. I really want one!! !